The episode opens with a family driving home from vacation, the dad is getting a little tired, so he decides to pull over and get some fresh air before something tragic happens - which will, no doubt, lead to tragedy, unless the episode is pulling a 'Doctor House'-style twist. But before we get there, quick comment - maybe my DVR didn't record the 'previously on', and I'm getting freaked out for nothing, but there was no clip package filling us in on Xander's abortive proposal to Garcia. Greg goes out on one date with a woman and there's a giant clip package about it next episode to set up her showing up at a race and meeting his son. Last episode television's cutest couple may have just broken up, and Derek did everything he could to sabotage the relationship, and there's not a peep. WTH, Criminal Minds? Okay, where was I? Roadside! Dad goes out to stretch, and when he gets back into a car and turns on the headlights a brutally beaten and filthy teen is revealed! Ah, so they're just rescuing someone? It was a "Doctor House'-style twist after all! The team is on the plane in the next scene, learning about the case. It seems that the teen probably escaped captivity, since he's barefoot and clearly ran through a cactus field while still wearing leg irons. Leg irons that the police decided to leave on him even after he'd arrived at the hospital. Was this really so important to document that you had to keep the kid in suffering until you'd taken pictures? Couldn't you have sprung the leg-irons immediately, snapped a few shots of the wounds and shackles, and assumed that would suffice? In any event, the kid's not talking yet, so they don't know who took him - or if his chance to escape came when another kid was abducted! That's right, there's been another abduction in the area within hours of the escape. Roadblocks were set up and alerts went out, but no clues have come up. Hopefully the escaped kid will have enough information to help lead them to the basement where the latest boy is being kept! Actually, it turns out that there are a few more clues - as the team drives into town, Garcia reveals that a helpful woman went to the police station to inform them that she remembers a similar crime from thirty years earlier! Then she saw a picture in a glass display case, got freaked out, and fled the station. Luckily she left her name and is on video, so it shouldn't be too hard to track down. Derek and JJ get to the hospital and discover that the kid won't let doctors touch him! According to a cursory inspection he's been held in a confined space for years, and although he's probably sixteen, his size wouldn't suggest that! Derek is sensitive enough to pull his shirt down over his gun to seem non-threatening before talking to the guy, but that wouldn't be an issue at all if he'd just dress like an actual FBI agent. Well, it could be worse - Reid could have showed up, wearing his low-self-esteem right at his stomach. Given how obviously messed-up he is, they tell Garcia to search for missing boys going back a decade. Oh, wow, that's quite a clue. Joe and Reid get to the police station and ask the cop about the pictures that spooked the woman. He explains that most everybody in the pictures is dead, and that the man she was probably staring at was her father, a local construction magnate who even built the police station! So yeah, they're going to need to talk to her. Joe and Emily go to talk to her, and the woman refuses to help, despite clearly having something to hide. She insists that her father isn't involved, and then cuts off the interview in an extremely suspicious fashion. 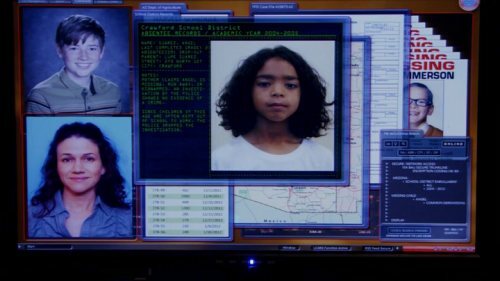 And the fact that this is set in Arizona, there's no mention of the possibility he's from Mexico or Central America, thus explaining a lack of local concern for his whereabouts. Then the kid freaks out when he hears an emergency alarm over the PA, and we're left wondering whether he's scared of any loud noise, or of buzzers featured in his captivity. 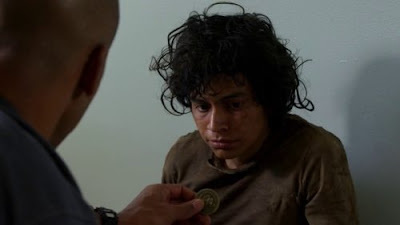 Then, in an incredibly lucky coincidence, the huge coin that Derek rolled to the teen as a means of communication happens to have a large picture of an eagle on it. JJ notices the teen's fixation with it, and asks him the significance - the teen points to the wings, then to his back. His name must be Angel! Over at the police station Greg talks to the latest victim's parents, trying to get a sense of how he would have been abducted when he was known to be a cautious kid. Then the woman returns to the station, obviously feeling guilty about shutting them down earlier. The opening of her conversation with Emily involves the woman describing her father's love of every manner of sports, which is so random that it's probably going to be important later. Then she claims that there were just flashes of a boy in chains from her memory, and that she doesn't even know if they're accurate. Greg and Reid are ready to make an unfounded assumption about the killer's M.O. - since the killer is so controlled, Angel couldn't have escaped from his cell, it must have happened during transit! This is just guesswork, of course, and bad guesswork, at that. After all, the premise is that the killer would be super-careful about his cell, but somehow less super-careful when it came to locking a kid in the trunk of a car (or whatever). If the guy made a mistake, what does it matter where it happened? Then they announce that the latest victim must have been targeted, since it's implausible that the killer would have lost Angel and then immediately driven an hour to Flagstaff in the hopes of randomly coming across a kid that met his twisted fetishes. This is actually a really good guess, but still one totally unsupported by the facts. After all, the guy could had just been driving around until he spotted a kid, and that didn't happen until Flagstaff - because they don't know when Angel escaped, there's no way of knowing how long the killer was on the prowl. The latest victim's parents can't think of anyone who spent untoward amounts of time with their child, so they're not a huge help in developing suspects or leads. For some reason Greg doesn't hold up a picture of the woman's father and say 'hey, have you ever seen this guy?' No, they don't have anything concrete linking the construction magnate to the crime, but he's one of their only possible leads, so why not check? MOTHER CLAIMS ANGEL IS MISSING, RUN AWAY, OR KIDNAPPED. AN INVESTIGATION BY THE POLICE SHOWED NO EVIDENCE OF A CRIME. There's more, but that's enough for the point - if the mother claimed he was abducted and the police investigated it, why was there no record at all of kids named Angel being reported missing in the past decade? In any event, they have the mother's current information, but when Angel hears that his mother will be there soon to see him, he does an exaggerated nervous swallow. Could she have been involved in his abduction? Did he think she was dead? Or is it just standard shame? Emily continues interviewing the woman, and hears a story about a night she went to sleep in the same bed as her dying mother, but was awakened by the sound of someone making chains in the basement. Then she saw that same dark figure sealing a chained boy up in a truck, then driving off. Was it her father? She won't say! Joe and Greg are concerned that this all might be a 'recovered memory', that thing from the 90s where therapists convinced people that they'd been molested or abused in Satanic rituals. Recovered memories generally involve a lot more guiding from the therapist than Emily is offering, though, so Joe may be wrong about this one. Either way, Reid starts following the father around, watching him go to the market and landscape his house. Which is the same house he's lived in since he married his now-dead wife. Is he sentimental, or did he not sell it because it has a torture dungeon? Of course, if he had a torture dungeon, why would he have been driving the kid in chains away from his house in that memory? Also, the show has yet to confirm whether he currently owns a van - which is vitally important information, given that no sign of the kid's bicycle was found, so the killer would have had to have used a vehicle big enough to easily conceal it. JJ and Derek are worried about Angel being exposed to his mother, what with all the shame he must be feeling from a near-decade of abuse. Speaking of shame, Angel slashes his wrist with a sharp object that some genius left in the room with the extremely emotionally disturbed teen. Great work, doctors. He pulls through, though, but he's bandaged and barely conscious when his mother arrives and is told that she can't see him just yet. On the upside, Angel feels safe enough to touch Derek's hand. So there's hope! There's a little more with the woman - the team wants her to wear a wire and find an excuse to go into her father's basement, hoping that the trip will trigger more memories! She's understandably nervous about accusing a possibly-innocent man of such horrendous crimes, but Emily explains that even if he did nothing, destroying their familial relationship will be completely justified if it was in service of helping to find a missing child, even if the only way it helps is that they know at least one house in the entire city definitely doesn't have a torture dungeon. Wow, Emily really wants to know what's in that basement. JJ interviews Angel's mother, hoping to discover a clue about the day of the disappearance. She also claims that she didn't call the police in order to keep the rest of her family from being deported, so I guess the computer screen was just a simple mistake by the graphics people. The woman goes into her dad's house and asks about some sporting equipment. He's absolutely fine with her going down to find it, but is certainly made suspicious by how nervous she acts around him. Joe and Emily debate whether his innocent behaviour should exculpate him, but no one pays attention to an important point in his dialogue. He knows that his daughter is lying to him for some reason - when he stopped by her tree nursery her workers said she was spending the day in Phoenix, but then he saw her truck at the police station. She tries to come up with a lie, but it's super-unconvincing. I'm not saying he's the guy, but he's acting exactly like someone who knew that he was being investigated and was sure the house had no evidence in it would. If it happened in World War I, it's not a legend. Either you're lying, or you should know the guy's name. Considering how incredibly well-documented the exploits of WWI fighter pilots were, there's no way something like that occurs without a name being attached to it. Finally Angel starts talking, but does he have any help to offer? Derek opens up about his own molestation (first time that's been mentioned in years! ), and uses it to create a connection with Angel. They try showing a photo lineup to him, but he says that it was always so dark that he never saw the killer's face. So if they had a photo lineup, why didn't they show it to the family of the latest kid? Emily keeps trying to convince the woman that her father is a murderer, claiming that she's buried memories of her father's inappropriate behaviour. Emily goes to the well of standard serial killer behaviour and asks if he ever gave her gifts when he was especially upset. He did! A bike and a catcher's mitt - the kind he'd have stolen from the young boys he murdered! If they think the father's basement is clear, why hasn't the team searched for any other property he owns? Why didn't they do that the second the considered him a suspect? All of the evidence comes together quickly - the last trophy the daughter got was a puppy, and Angel's mother remembers puppies being given away on the day of the abduction! Also Angel was repeatedly bitten, but then he stopped, and the woman remembered her father having his teeth recapped a few years earlier! So yeah, all the evidence is pointing that guy's way. The team searches the father's house, but comes up empty. Luckily there are a few outbuildings (which should have been mentioned earlier), but when they find the concrete pit, the kid has already been moved from it! Once again going to the 'serial killer behaviour' well, the team assumes that father will want to bury the kids someplace he can visit a lot. Oh, and they explain that since young boys love to hang around construction sites, the killer would give them rides on his backhoe, so that's probably how he met his victims! So anyway, the daughter explains that every couple of years he adds a new house to his first development, so there must be a kid under every single one! The team arrives just in time to save the kid from being buried alive, and then Derek beats the killer up a little, but sadly it's a non-fatal assault. The kid is returned to his family, Angel reconciles with his mother, it's a super-happy ending all around! Other than the serial killer being alive, of course. With no mention of Garcia's relationship stuff. Come on, show, get with the program and give us what we want! Derek does have a little more info, explaining that this case hit close to home, since had he not been molested, he never would have become an FBI profiler. Is that really true, though? Didn't you go into it as a way of honoring your dead cop father? Maybe the child molester affected the branch of law enforcement slightly, but that's not really the main motivator, is it? Actually, yes! By feeding the daughter stories of standard serial killer behaviour they were able to remind her of things her father had done. Of course, they only get partial credit, since had she not come in and accused her father of the crime, they wouldn't have had anything. A woman walked into the police station and said she knew who the killer was. Had the cops brought him in for questioning and done even the most cursory search around his property, they would have found an outbuilding where the abducted kid's bike was sitting in plain view. So yes, it was extremely solvable. 4/10 - A far more competent episode than usual, although it reinforced the central problem with profiling - it's not really useful unless you already have a really good idea who the killer is. Which makes it not really useful at all. I'm watching these on Lovefilm, and they put this episode before I Love You, which could explain why there's no recap of the Garcia/Kevin situation?